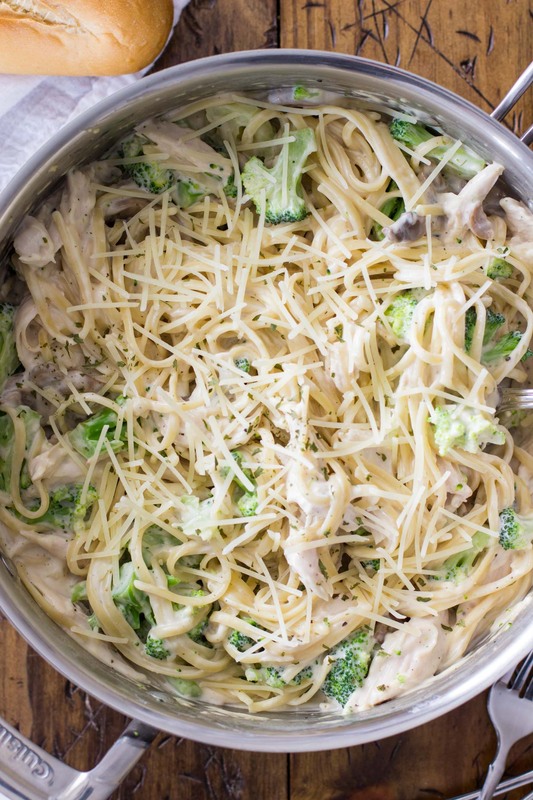 This cheap, quick and easy Turkey Alfredo, can be on your table in less than 15 minutes. 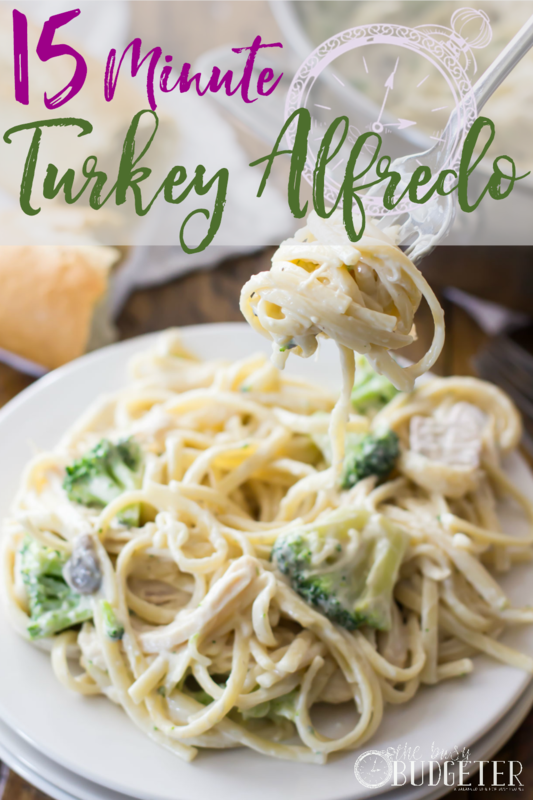 This 15 minute leftover turkey alfredo is a super quick and hearty dinner that can be made with leftover turkey (of course, rotisserie chicken could also be substituted!). Are you ready for the holidays? I’ll admit, I’m still not. There’s a lot of preparation that still needs to be done around here, but I am prepared for the days following the holidays. 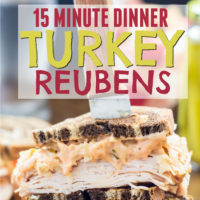 I already know exactly what I’m going to be doing with my leftover turkey, and I wanted to share this recipe with you, too! 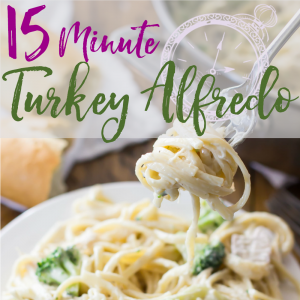 It’s a quick and easy leftover turkey alfredo, it takes 15 minutes to make and is a hearty and comforting dish for the whole family. 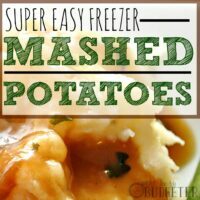 It’s also great for when you want a break from the standard turkey & mashed potatoes leftovers (because as much as I love them, I can get tired of eating the same thing every night just for the sake of clearing my fridge!). I promise, this dish is fast, easy, and all around amazing. Let’s get started! 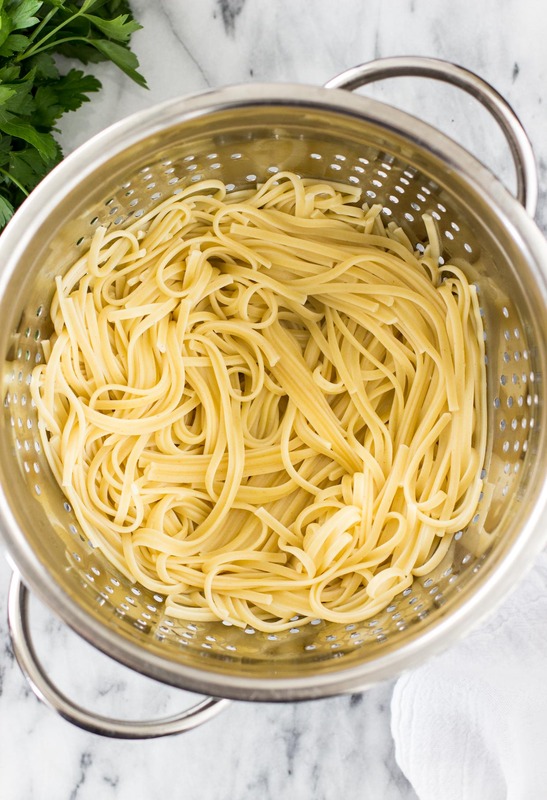 The first thing you want to do is begin cooking the pasta. Just follow the package directions — boil the water, add the pasta, and cook/boil about 7 minutes, stirring occasionally. While the pasta is cooking, get started on your sauce! Since we’re using a jarred alfredo here it makes things especially easy — no whisking flour or worrying about cheeses that curdle. We are going to jazz that sauce up, a bit, though. First, melt a little butter or olive oil in a large saucepan and then stir in the sauce and a third cup of milk. 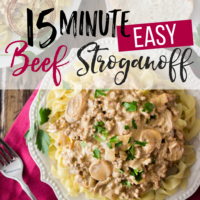 I like to add the milk because it gives you a little more bang for your buck — it helps thin the sauce a bit so that every single bite is coated in creamy alfredo sauce — yum! I also add mushrooms, but that’s optional, of course. Add your shredded turkey and stir well. And now let’s get back to the pasta, shall we? At this point, your pasta should be just about done cooking. Drain the pasta and immediately add the drained noodles to your sauce/turkey mixture. Stir it up well! Pop a bag of steam-in-bag broccoli into the microwave and nuke it according to the instructions on the package. Stir that in along with your noodles and turkey, and you’re done! I always like to sprinkle a handful of parmesan cheese (or mozzarella) on top. I feel like I should say this is optional, but in my house cheese is never really optional. Let the cheese melt for a few moments and then stir everything up nicely and serve! 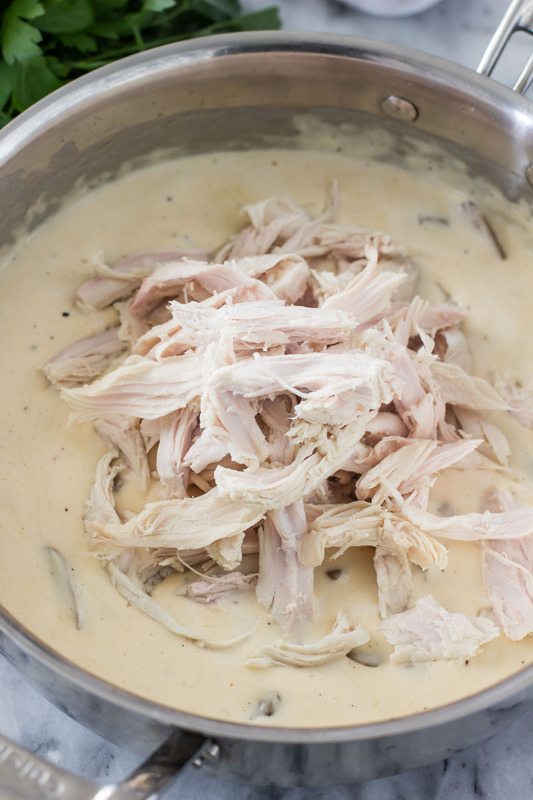 Fast, simple, and delicious, this is a great way to repurpose leftover turkey (though of course you can use it with leftover/rotisserie chicken, too!). Enjoy! What's your favorite way to use up leftover turkey? This was the exact recipe I needed. I used fettuccine rather than linguini and it turned out great! 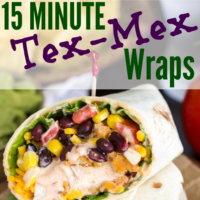 It took me quite a bit longer than 15 minutes to prepare it though. I’m not a fast cook, but I’m not a slow cook either… I guess I am a half-fast cook.